Play enough bike polo and you'll be an expert at slap truing a wheel. I've been playing bike polo on a slap trued wheel since June. It's not straight as an arrow, but it's sure good enough for polo. 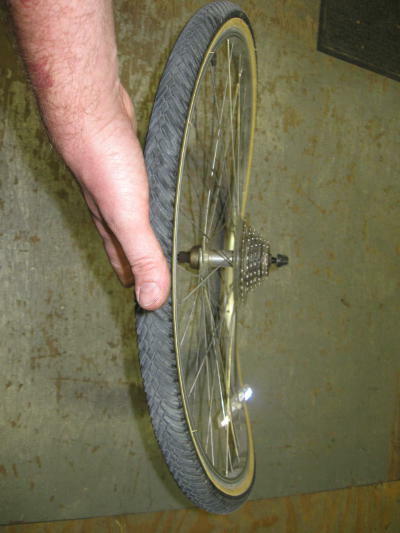 At the Wheelmen's National Meet last month, straightening a high wheel like this was discussed. Instead of slapping, though, it was put in a doorway and pushed sideways til it popped back into shape. I do like the finesse involved in slapping a small wheel on the floor! I can attest to the quality of a wheel built by CC... My Surly's wheels are custom builds!